When you travel, you may feel so stressful with packing and a ton of luggage to take with. 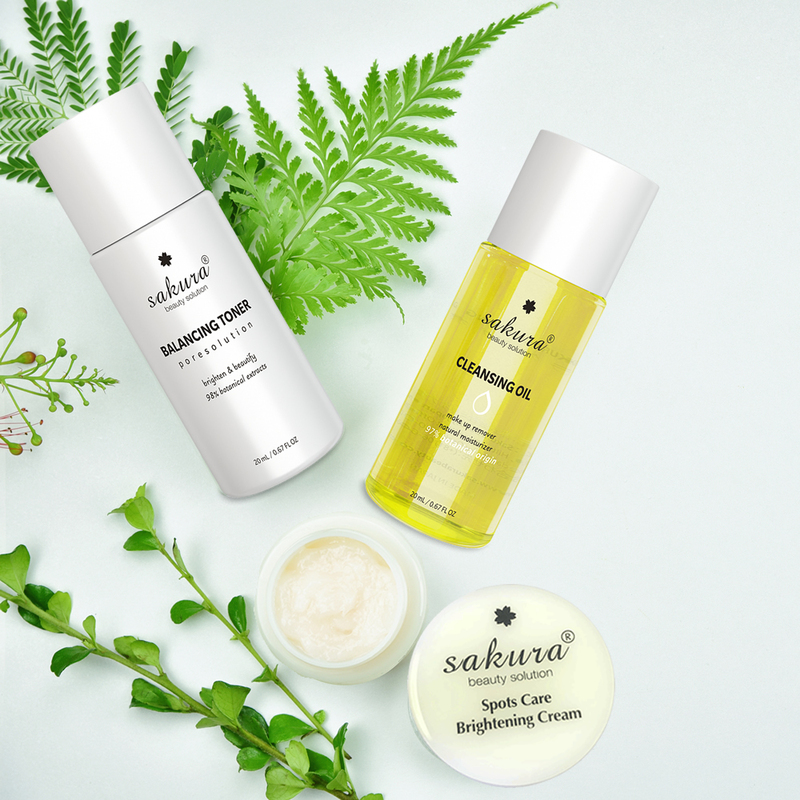 To make your trip easier, Sakura Beauty make a travel set to deliver the best skincare routine to customers who love and choose Sakura Beauty products. We add 5 products in a set to have you take care of your skin the best during your trip. Using Directions: Take an appropriate amount and apply on face and neck in the morning and before going to bed. - A mild emulsion formulation with natural moisturizing ingredients that protect the skin from the loss of moisture and permeability to the skin. - A series of powerful antioxidant active ingredients extracted from Green Tea, Cheek, Chamomile, ... acts as a shield against skin aging and UV damage. - Licorice extract helps to nourish and tone skin tone, prevent skin aging, inhibit histamine suppression of redness and irritation caused by UV light, lock the movement of melanocyte causing skin pigmentation and brown spots. Using Directions: Apply a thin layer on face and neck. Thoroughly blend cream on the skin. For best results, use every morning as foundation base before sun exposure. This soft and light make-up control base penetrate deeply to visibly conceal pores and blemishes while balance skin tone and naturally brighten skin. This CC cream applies on smooth and evenly with a creamy texture that is ultra-thin and ultra-clear. Sakura CC Cream Flawless Control Base is formulated with Green and White Tea extract to protect your skin against harmful UV rays, with SPF 50, preventing aging and wrinkles formation. Using Directions: Apply a thin layer on face and neck. Thoroughly blend cream on skin. For best results, use every morning as foundation base before sun exposure. This gentle cleansing oil is enriched with 98% natural ingredients to effectively dissolve impurities and makeup then leave skin feeling clean, soft and radiant. Simply glide oil onto dry skin and add water for light-weight, lather then rinse away. With a lemon and orange scent, this nourishing formula features borage, Camellia Japonica Seed Oil, Olive Oil, Rosa Canina Fruit Oil, Prunus Yedoensis Leaf Extract to leave your skin feeling silky-soft and smooth. Suitable for all skin types. Using Directions: Pump cleanser into dry hands and massage over dry face. Splash warm water onto skin and massage to help dissolve surface impurities and makeup. Repeat this process to thoroughly remove long-wearing makeup. This alcohol-free toner is formulated with 98% botanical extracts helps balance skin’s pH levels for fresher skin. With the addition of this toner to your skincare regime, it will help treatments and serums to penetrate more effectively. This non-drying, tone balancer gently exfoliates to help refine and clear clogged pores and promote smooth, even complexion. Removing dead skin cells and minimize the appearance of fine lines and wrinkles. Using Directions: After cleansing, apply Balancing Toner onto face and neck with a cotton ball. Do not rinse off. Follow with Sakura Regimen. At the end of the day after cleansing face with Sakura Cleansing Oil, to calm your skin, our Sakura Balancing Toner will keep your skin refresh after a long day of travel or be being so exhausted with outdoor activities. Please apply Sakura Spots Care Brightening before going to sleep. We wish you have a pleasant time with your friends and family. To purchase Sakura Travel set, you can look on our Sakura Website or call us at 1800 757 6039 or 678 435 7986 to have the best deal.